Jeff is the creative force behind Discovery Channel’s Shark Week. He’s been the executive producer, director, underwater cinematographer, editor, writer and on-camera “shark expert” for 44 episodes since 1991, including the ground-breaking Air Jaws programs which earned him an EMMY nomination. As a spokesman for the show, he's appeared on numerous TV talk shows and has been featured in a variety of print publications. 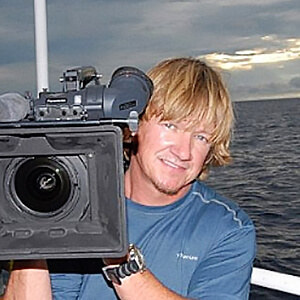 Known for innovative filmmaking techniques, Jeff has used night vision, thermal imaging, remote operated submersibles and helicopters, robotic seals, towed underwater cameras, submarines and high-speed cameras to capture unprecedented shark behavior. He was also the first to capture breaching white sharks in super slow motion. In addition to his film work, Jeff was a contributing writer for Field Guide to the Great White Shark.